A friendly warning / Gee Whiskers! I recently tried out the Trind Nail Repair nail treatment because my nails are going through a slump and needed a bit of a boost. I had the most painful experience - all because I didn't care to read the insert of the box (stupid me!). About 20 minutes after applying the second coat I started to feel a slight tingling feeling under my nails and then it all of a sudden started to burn like mad. I can't even begin to describe how painful it was. What happens when you have thin nails, is that the active ingredients soak through the nail and then work on your nail bed which causes the painful burning sensation. It was so intense at one stage that the pain was traveling up my arm and I resorted to sticking my nails into the ice of the freezer at work. Luckily I had an Essence nail corrector pen on me which I could use to slowly remove the product off my nails - it took me over 30 minutes to get it all off and the pain only started to ease about 30 minutes later. After 2 hours my nails were still feeling incredibly sensitive and tender. This post is not meant to degrade the Trind brand or put people off trying it out, because I have read many reviews about how wonderful it works. This is simply a product that cannot be used on thin nails - and Trind does warn people on their website not to use this treatment if they have thin nails. However, I do think it needs to be printed on the actual box. People don't google search everything while standing in the store - you read the label on the box and use that to base your purchasing decision on. The insert also doesn't specifically state that people with thin nails cannot use this product without experiencing a lot of pain. You can buy it in tinted colours (Beige, Lilac, Pink and pearl shades), so you get all the benefits of the nail treatment with the added perk of having some colour on your nails. The brush bristles are an amazing shape and makes applying the treatment very easy. The formulation, although harsh on thin nails, does definitely work. After removing the product (which has been on for about an hour) and allowing my nails some time to calm down - I did notice that my nails were whiter. I was battling with stained and weak nails. The way the cap is shaped makes it very easy to grip and even better - opening and closing the bottle is made VERY easy. ALWAYS read the inserts and follow directions of use when buying nail treatment products. I think with treatment products, it's best to do a google search to make sure it is suitable for your nails. Test the products out on a little area before applying to all your nails. Carry nail polish remover pads in your handbag. Not only are they great for removing chipped nail polish on the go, but in situations like I had they are invaluable! I took them out of my handbag at some point and forgot to put them back. Thank heavens I had the corrector pen. (you can see what all I carry in my handbag in a past post I did). As I said in the post, I have heard good stories about the product and it was spoken highly of by Glambox (where I got the product from). So it's just if you have thin nails you have to be careful and steer clear of it. This is like a beauty horror story. Talk about suffering for beauty. Glad it didn't permanently damage your nail bed. Sounds so painful. Thanks for the heads up because I have thin nails! I'm typing this with sore nails! 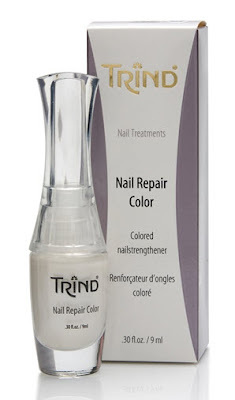 I've been using trind nail repair for about a month along with the nail balsam (my nails love that stuff!) And my nails have massively improved, big reduction in peeling and softness. But I think I've reached peak hardness and I need to lay off the nail repair for a while. Last night I did something I don't usually do - I buffed my nails. That seems to have thinned them just enough for the formaldehyde in the nail repair to become a problem and my nails have hardened a bit too much and pulled away from the nail bed. Took it off this morning and stuck to moisturising like mad. I've got the trind keratin restorer now, which is supposedly for sensitive nails but I will give it 24 hours and see how I get on with bare nails before I put on a protective coat of anything. HUMIC FULVIC ACID has an extraordinary proprietary formula featuring the richest source of 100% bio-available Humic Fulvic Acid along with micro and marco mineral nutrients. This highly refined product consists of tiny, extremely complex molecules. The unique nanotechnology used in this formula sets it apart from any other product claiming to be similar in nature. I did not read the insert and experienced exactly as the person who started this thread. What I do want to know is which product of Trind will help with the matrix of the nail.